180 years ago, on January 26, 1837, the Detroit Free Press was nearly six years old. The University of Michigan was pushing twenty years old. And the State of Michigan was just born. 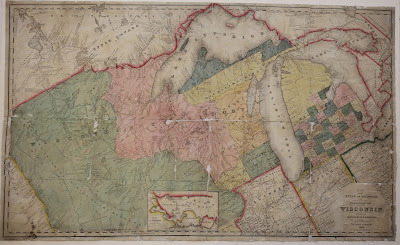 Before becoming a state, that land that would become the state was first recognized by the newly formed United States Government as the Northwest Territory (1787-1803). 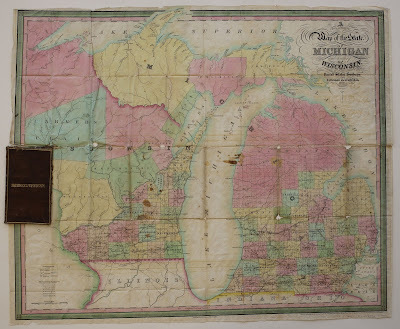 After Ohio obtained statehood and the Northwest Territory was dissolved, the land was then defined as the Territory of Michigan (1805-1837). 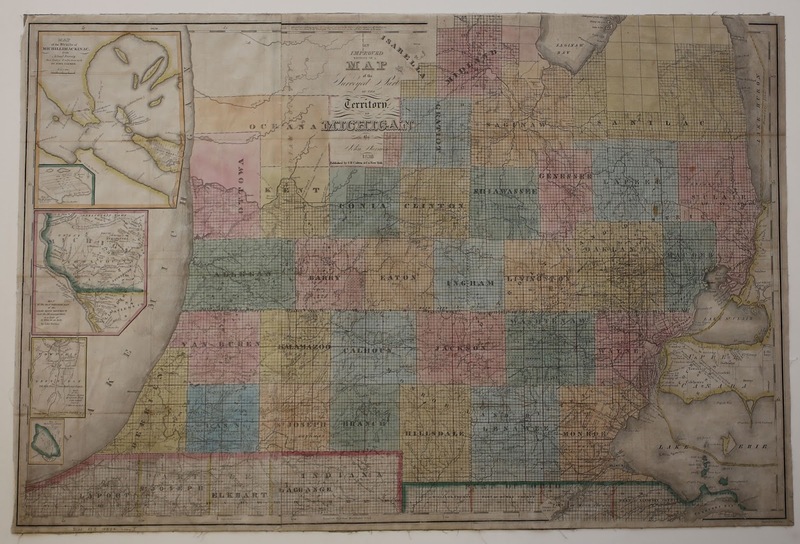 With an increasing population in the 1820s-30s, the people of the Territory of Michigan aspired for statehood like others that made up the Northwest Territory but had since been admitted to the Union: Ohio (1803), Indiana (1816), and Illinois (1818). In 1835, a constitutional convention was held and the people of Michigan adopted a constitution. All that was left was for Congress to formally accept the petition of the people of Michigan to be admitted to the Union. Unfortunately, there was a delay in Congress that was thirty years in the making: the dispute over the Toledo strip. After the semi-bloodless Toledo War and the intervention of President Andrew Jackson, Michigan was offered an ultimatum in June of 1836. Michigan would not be admitted to the Union unless they gave up claim to the Toledo Strip. 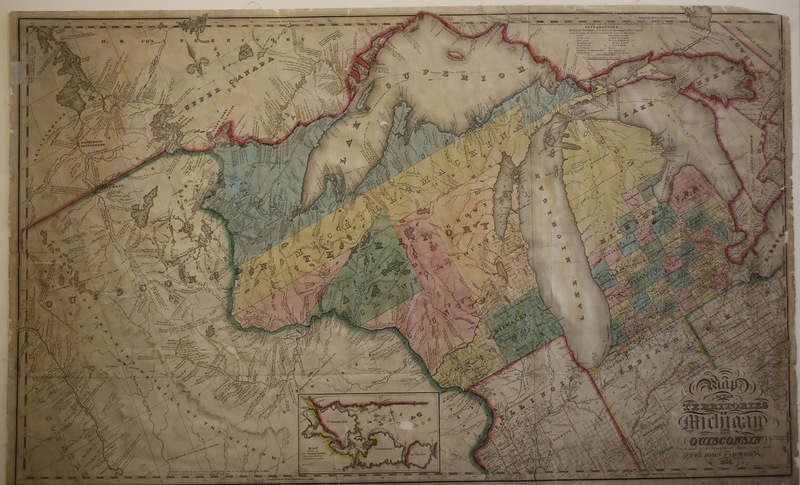 In return for acquiescing, Michigan would be given the then-thought-to-be worthless western three-quarters of the the now-called Upper Peninsula. Initially, the people of Michigan turned this offer down because the 400 square miles of the Toledo Strip was thought to be worth much more than the near 15,000 square miles on offer. Six months later, and with much controversy, the people of Michigan obliged and Congress then accepted the petition for statehood. 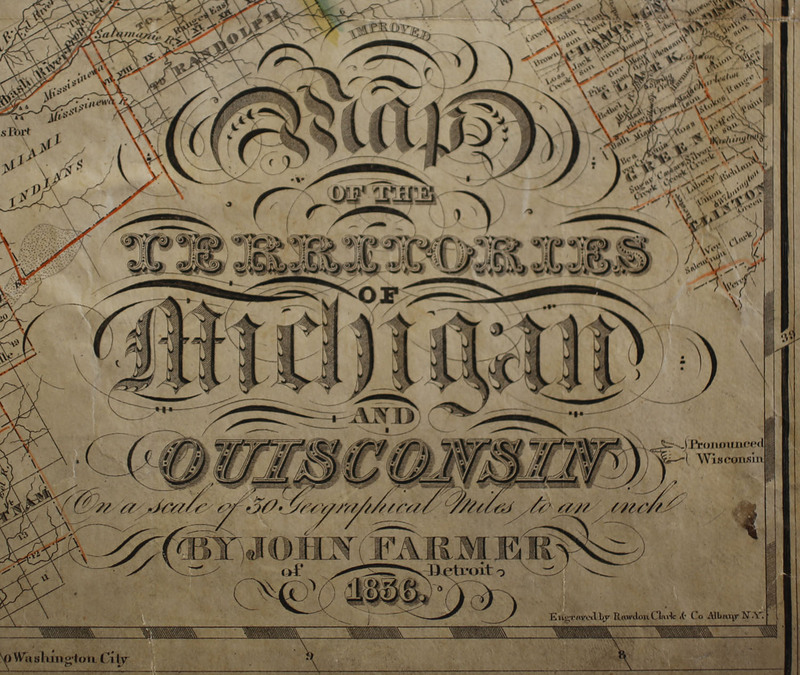 With so many changes in such a short time period, one can imagine the difficulty cartographers and printers had in keeping maps of Michigan updated. 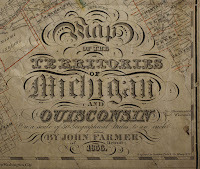 While many maps from the 1830s simply have "Michigan" written on them with no indication of whether it is a state or a territory, some do. Below are images of maps in the Clarke's collections dating from 1836, 1837, and 1838 showing the birth of the State of Michigan in cartographic form. 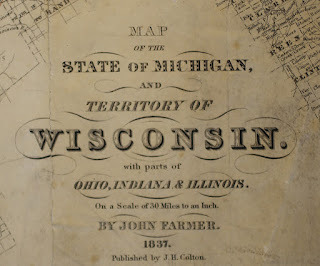 In fact, John Farmer's 1837 map of the "State of Michigan and the Territory of Wisconsin" is the earliest known map to have "State of Michigan" printed on it. 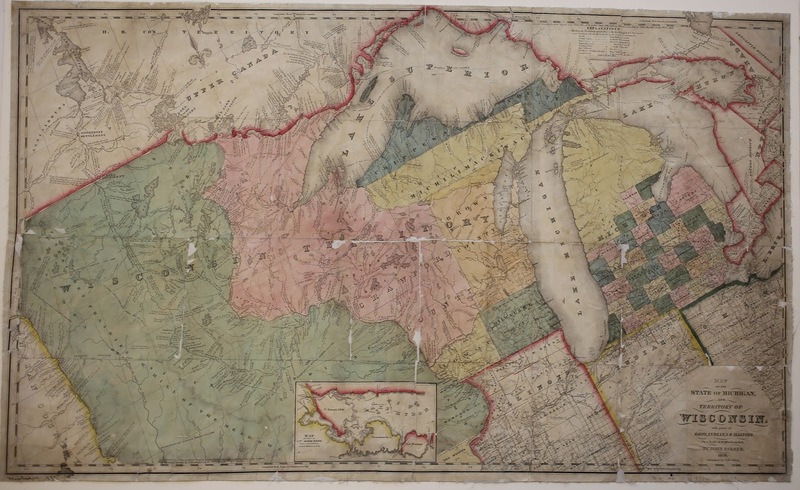 (see Leo Karpinski's robust bibliography of maps of Michigan from 1804-1880). Note that Farmer's 1836 map of the "Territories of Michigan and Ouisconsin" shows Michilimackinac and Chippewa Counties extending across Wisconsin and into Minnesota, while the 1837 and 1838 maps show a definite border between Michigan and Wisconsin. For a better view of all of the photographs, click on the image for an enlargement. 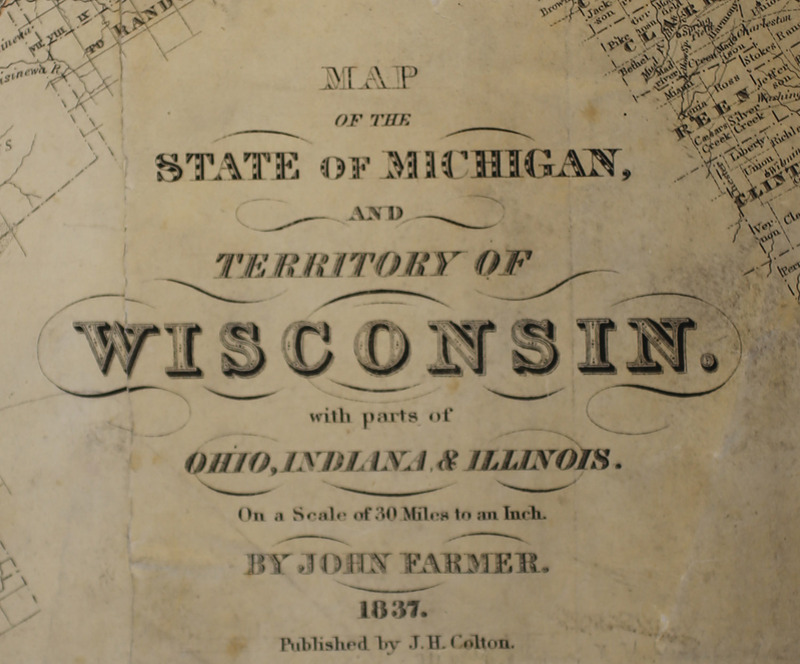 1836 Farmer Map: "Territories of Michigan and Ouisconsin"
1836 Farmer Map: "Surveyed Part of the Territory of Michigan"
So on your 180th birthday, Michigan, we hope you enjoy your baby photos from your first year! 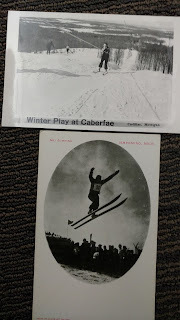 With continued inclement weather, I thought about Michigan winter activities documented in the manuscript collections in the archives. We have one collection which includes images of a snow plow in action: Ann Arbor Railroad Company Photograph collection, 2006. Then, I also thought about school closings due to weather. We do not have any manuscripts just on that topic, although I"m sure a number of the District School volumes document bad weather days. William Jamerson Film Collection, 1920, 1962 includes skiing, Ski villages at multiple sites in Michigan, as well as winter festivals and events. City of Petoskey (Mich.) Scans and CDs of photographic collection, 2013 includes 1300 scans of images 19-20th c. mostly in Petoskey with winter sports. The Clarke Historical Library's upcoming speaker series has been announced. All of our presentations are free and open to the public. 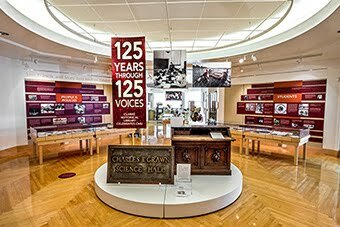 The programs begin at 7:00 pm in the Park Library Auditorium with a reception immediately following in the Clarke Historical Library. If you have questions or need accommodations, please contact us at 989-774-3352 or clarke@cmich.edu. 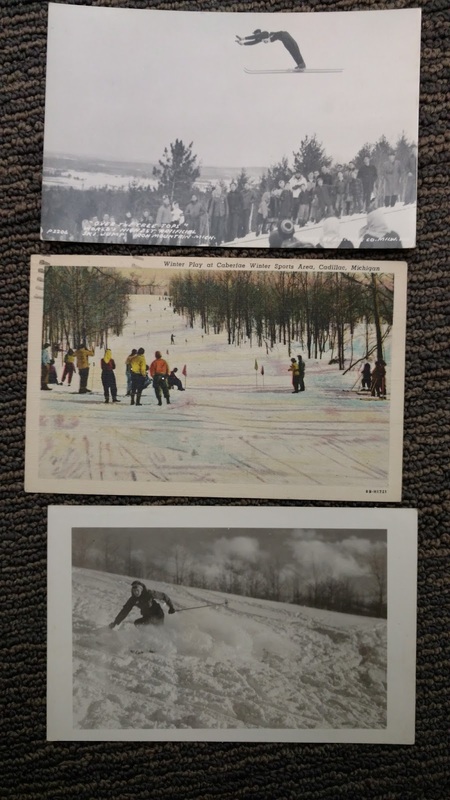 B.F. Childs was one of the most prolific photographers of the Lake Superior region. 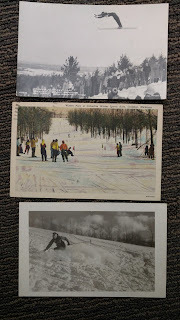 Photographer and collector Jack Deo will travel back in time to present a 3D slide show of historic Lake Superior scenes including Native Americans, copper and iron mining camps and towns, lake transportation, and the beautiful scenery. 3D glasses will be provided. 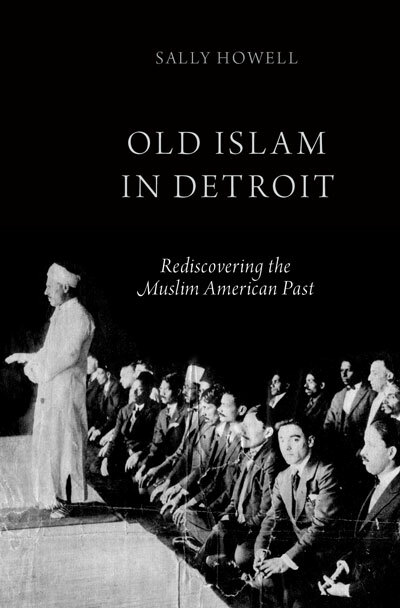 Author of Old Islam in Detroit: Rediscovering the Muslim-American Past (Oxford: Oxford University Press, 2014)​ to speak about her research. This program is presented in partnership with the African Humanitarian Educational Research Organization (AHERO), a Central Michigan University student organization. On April 2, 1917, Woodrow Wilson asked Congress to declare war on Germany. This remembrance is presented in cooperation with Central Michigan University’s Center for International Ethics.